As it is American Craft Beer Week and I really have not done any articles to acknowledge it, I thought this might be a good time to talk about re-release of the first canned American craft beer. A couple months ago I got an email asking if I would like to try a new beer that was being released nationally by the Pabst Brewing Company, Old Tankard Ale, an English Mild Ale. Now let there be no mistake, I am not a fan of Pabst Blue Ribbon in any way but when I read that the re-release of Old Tankard Ale was using a 1937 brewer’s log recipe I was intrigued as it was the number two nationwide seller in the 1930’s through the 1950’s. I wondered what was killing it back in the day. These photos are from opening day of the week-long 7th Annual IPA Festival which is being held at Naja’s Place in Redondo Beach. They are holding it a little earlier this year, which may be because they decided to coincide it with American Craft Beer Week; I will try to find out. It is safe to say that this event has become very popular and brought in people from at least as far as San Diego. Naja’s opened at 2:00 PM and by 4:00 I heard people asking, “Don’t these people have jobs?” The selection of IPAs ran the gamut from sessions to barrel-aged and there were plenty for a hophead like me to try that I only heard of; and some that I had not. It was a nice opening to what promises to be a week of great, hard to find IPAs. The 7th Annual IPA Festival runs through Tuesday, May 19th. Today featured local IPAs from places like Strand Brewing, El Segundo Brewing, Smog City, Monkish, King Harbor, Phantom Carriage, Three Weavers and about 60 other taps from all over. Tomorrow, Thursday, will be their Ballast Point day featuring five different types of Sculpin; Saturday will be their Pizza Port day, always a crowd favorite, featuring at least 13 of their brews. They open at 2:00 PM on weekdays and noon on weekends. Sunday was day seven of the 9th Annual American Craft Beer Week and it was a fine ending to a fun week of some really nice craft beers. Since my theme for this year’s ACBW was local production breweries, brewpubs and locations that specialize in American craft beer and there were only two production breweries with tasting rooms in the South Bay that I had not visited yet, I decided to start off with Strand Brewing Company and Monkish Brewing Company; the first two production breweries in Torrance. Before I left the house I saw on Facebook that there was a bicycle race going on in the industrial complex that Strand Brewing is located in. Strand Brewing fans are probably aware that co-owner and head brewer Joel Elliott is an avid cyclist, so it was not surprising that his backyard would be used for a cycling event. Unfortunately, Telo Road (the street they are located on) was blocked off and I suspect many people did not work around it as there tasting room was a little slower than normal; so there was not a lot to photograph. My girlfriend and I had our Expression Session pale ales then headed out to our next location. Saturday was day six of the 9th Annual American Craft Beer Week and it was also the one year anniversary for Torrance production brewery, Smog City Brewing. To say that Smog City went all out on this event would be an understatement. I mean to say that Smog City’s previous events have always been well done with lots of special beers but their one year of experience combined with the experience gained by hosting large events made this one quite smooth. There were close to 700 attendees throughout the day, but with the use of three separate filling stations the lines seemed to move quickly. The day started with a VIP session that allowed ticket holders to get a two hour head start on the general public thereby ensuring access to the small batch specials that were made available like Quercus Circus and The Tempest, two brews that tapped out fairly early. I made two visits to Smog City, so the photos begin with the VIP session and then a few hours later when I returned. 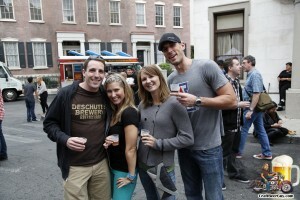 Downtown Dogs provided a special menu for those that needed some food to soak up all the good beer. Friday was day five of the 9th Annual American Craft Beer Week and the day consisted of some ups and downs and twists and turns. I started off at the Total Wine in Redondo Beach because my friend Shane Kral, the local face of Firestone Walker, was hosting a Beers of Summer beer tasting. The beers being featured were the 805, Pivo Pils, Opal and Easy Jack. These are all great beers for the hot days we have been experiencing lately, with the Easy Jack being a personal favorite. I heard that Easy Jack has gotten so popular that Firestone Walker has to scale back on it due to a lack of hops. This is terrible news and could mean trouble for us hopheads if the shortage is getting that bad. Anyway, all four are fine beers and I drink them frequently; and Shane is a great guy and I see him frequently but neither of those was the main reason we went there. I had been informed that bottles of Firestone’s Stickee Monkee were going to be made available for purchase before anywhere else. At the last minute the distributor changed their mind; there were several disappointed faces in Total Wine at hearing this news. 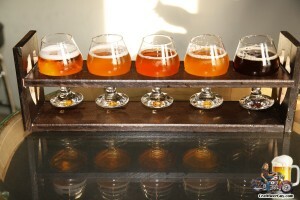 Wednesday was day three of the 9th Annual American Craft Beer Week and in keeping with my theme of visiting our local production breweries, brewpubs and gastropubs I decided that I would visit the two new tasting rooms that were not even in their construction phase last year at this time. Our first stop was at Absolution Brewing Company in Torrance. Absolution Brewing opened their doors unofficially on March 1 with the official ribbon cutting taking place on April 25. Unlike most of the production breweries around here, Absolution brews in a more European style which really translates to lower carbonation. Some people that are only accustomed to “west coast” styles of craft beer like to suggest that the beer may be flat. If they ventured out of their comfort zone they would realize this is not the case at all. I have to think that Absolution Brewing has become very welcome as they are the one tasting room I visit that seems to constantly have a large number of customers. In the short time I was there they must have sold five kegs to go! I know some people complain that Absolution ran out of too many from their selection of 10 brews on the unofficial open but they do not realize that this was due primarily to Daily Breeze writer Nick Green being unable to stick to the facts and writing an article that appeared on the front page of the Breeze announcing that Absolution was opening two hours earlier than what it should have been. This resulted in a long line of people at the Absolution doors two and a half hours early. Naturally, they opened the doors and many brews were tapped out within minutes of when the actual opening time was supposed to be. I don’t know that the Absolution team realized just how popular their beers were going to be. Tuesday was day two of the 9th Annual American Craft Beer Week and I really wanted an IPA. For those not in the know, we have been enduring a pretty bad heat wave and a couple cold beers were just what the doctor ordered. An IPA and some air conditioning would be even better. I decided to start off by heading to Long Beach for a visit to the Great American Beer Festival’s 2013 Mid-Size Brewpub of the Year, Beachwood BBQ & Brewing. Monday May 12 was day one of the 9th Annual American Craft Beer Week, and it is the third consecutive year that I have covered the event. In 2012 I participated by trying to find as many American craft beer locations as possible in the South Bay. In 2013 I set out to visit as many Great American Beer Festival gold medal award winning breweries as possible. Since there has been such an explosion of growth in the craft beer sector around here, I decided that this year will be devoted to the local craft breweries, brewpubs and gastropubs.